For other uses, see Almshouse (disambiguation). An almshouse (also known as a bede-house or poorhouse) is charitable housing provided to people in a particular community. They are often targeted at the poor of a locality, at those from certain forms of previous employment, or their widows, and at elderly people who can no longer pay rent, and are generally maintained by a charity or the trustees of a bequest. Almshouses were originally formed as extensions of the church system and were later adapted by local officials and authorities. 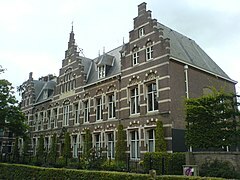 Many almshouses are European Christian institutions though some are secular. Alms are, in the Christian tradition, money or services donated to support the poor and indigent. Almshouses were established from the 10th century in Britain, to provide a place of residence for poor, old and distressed people. They were sometimes called bede-houses and the residents bedesmen or bedeswomen. Bede is the Anglo-Saxon word for prayer and the alms-men and women were obliged to pray for the founder of the charity. The first recorded almshouse was founded in York by King Athelstan; the oldest still in existence is the Hospital of St. Cross in Winchester, dating to about 1132. In the Middle Ages, the majority of European hospitals functioned as almshouses. Many of the medieval almshouses in England were established with the aim of benefiting the soul of the founder or their family, and they usually incorporated a chapel. 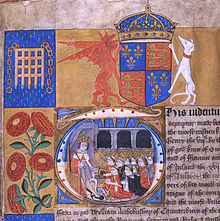 As a result, most were regarded as chantries and were dissolved during the Reformation, under an act of 1547. Almshouses generally have charitable status and aim to support the continued independence of their residents. 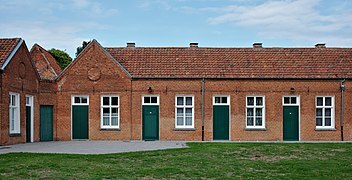 There is an important delineation between almshouses and other forms of sheltered housing in that almshouse residents generally have no security of tenure, being solely dependent upon the goodwill of the administering trustees. In 1269 or 1270 an almshouse was established in Stavanger as the first known in Norway. The English tradition of almshouses was introduced to the Commonwealth of Pennsylvania by its founder, William Penn. The Maryland legislature created almshouses in Anne Arundel County, financed by property taxes on landowners throughout the state. Massachusetts also had a long tradition of almshouses. In the United States, aid tended to be limited to the elderly and disabled, and children had to sleep in the same rooms as adults. The first almshouse in the United States history was founded in Boston, Massachusetts in 1622. The original Boston Almshouse was burned down in 1682 and was rebuilt away from the heart of Boston nearly a decade later. In 1884 the statistical analysis of the Massachusetts almshouses showed four in the city of Boston and 225 almshouses throughout the state. These almshouses housed nearly 7,000 people. Of these residents, 700 were believed to have a mental illness. Half of these almshouses did not house children. Upon entering the Almshouses in Connecticut, patients were whipped ten times. There were similar institutions developed from 1725-1773 in Pennsylvania, Rhode Island, Virginia, and New York. At the Pennsylvania Hospital, some "lunatics" were chained to a cellar wall or made to wear a primitive straitjacket. Before the American Civil War, local officials regulated almshouses and did not ensure the people inside them were being cared for in the proper way or given the time they needed for help. It was not until the 1860s that more progressive states such as New York began to create boards that regulated, inspected, and reported on almshouses. The Newark almshouse opened in September 1878 as a branch of the Syracuse State School. It was located on 104 acres of land within the town of Newark, New Jersey and held around 853 patients. The nine dormitory buildings that housed the patients were able to hold anywhere from 45 to 130 people. There was also a small hospital within the almshouse that could hold up to 30 patients. There were not many employees, only about 110, to take care of the hundreds of young women admitted to the almshouse. Patients were committed to the Newark State School by superintendents of the poor as well as judges who declared them insane or feeble-minded in court. Many of the patients of the New York Custodial Asylum for Feeble-Minded Women were falsely considered to be mentally ill. Mary Lake was the daughter of a young woman who had been sentenced to 10 years in a state prison. 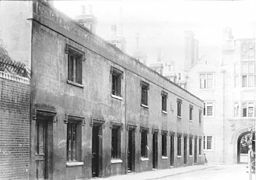 Mary and her other siblings were split up and put into almshouses. She was committed to the almshouse in Newark as feeble-minded. It was not until years later where she was pronounced not mentally ill and was able to leave the almshouse. Throughout the 19th century almshouses were a last resort for those who were poor, disabled, and elderly. Residents experienced mistreatment, destitution, and inhumanity. As almshouses continued into the 19th century, activists such as Dorothea Dix fought for institutional reform. Dix sought to remove children, the mentally ill, and the developmentally disabled from all almshouses and increase the number of institutions, hospitals, and asylums for those to reside in. As her movement gained momentum, she played a vital role in the establishment and expansion of over 30 hospitals for the treatment of the mentally ill. Her efforts removed specific groups from almshouses, leaving the elderly to remain. Almshouses are often multiple small terraced houses or apartments providing accommodation for small numbers of residents. 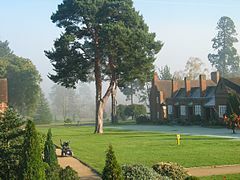 Some 2,600 almshouses continue to be operated in the UK, providing 30,000 dwellings for 36,000 people. 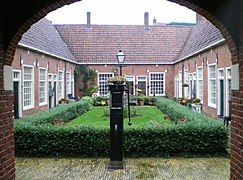 In the Netherlands, a number of hofjes are still functioning as accommodation for elderly people (mostly women). 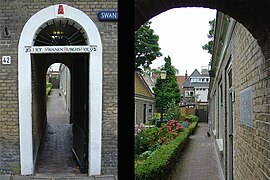 The economics of almshouses takes the form of the provision of subsidised accommodation, often integrated with social care resources such as wardens. The basis for civil almshouses and workhouses in England was the Act for the Relief of the Poor. These institutions underwent various population, program, and name changes, but by 1900 the elderly made up 85 percent of the population in these institutions (Day 2009). The Bakewell Almshouses date from 1709 and housed six separate homes, hence the six front doors that can still be seen today. The homes had one tiny room downstairs and one upstairs, no bathroom, toilet or kitchen. The Manners family, Duke of Rutland from 1703, maintained the building until 1920. They gave it and the adjacent former town hall to the trustees who had been running the charity. The town hall was sold at a 1966 auction for £1,137. Financial problems caused the homes to become derelict and unfit for habitation by 2001. They were rescued and restored by the trustees in 2004-2006 at a cost of £325.000, which was raised through donations and grants. They are now three larger homes, combining modern facilities with many historical features. ^ Bremner, Robert Hamlett. The Discovery of Poverty in the United States. Transaction Publishers. ISBN 9781412836555. ^ "Photography » Ancestral Deeds - Research & Transcription Services". www.ancestraldeeds.co.uk. Retrieved 15 September 2016. ^ The National Cyclopaedia of Useful Knowledge (1847) Vol III, London, Charles Knight, p.76. ^ "Diplomatarium Norvegicum Volum 10 No.4". www.dokpro.uio.no. Retrieved 15 September 2016. ^ "Asian Caregivers & Elderly Care". Myasiannanny.com. Retrieved 15 September 2016. ^ "Guide to the Almshouse Records" (PDF). 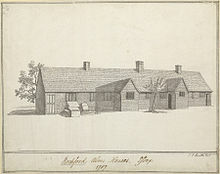 ^ "The Management of Almshouses in New England". ^ Nielsen, Kim (2012). A Disability History of the United States. Boston, Massachusetts: Beacon Press. p. 38. ^ Nielsen, Kim (2012). A Disability History of the United States. Boston, Massachusetts: Beacon Press. pp. 37–39. ^ The Institutional Care of the Insane in the United States and Canada. Baltimore, MD: The Johns Hopkins Press. 1916. pp. 250–251. ^ "Detained for 15 Years as 'Feeble-Minded'" (PDF). The New York Times. October 26, 1901. ^ "Dorothea Dix (1802–1887)". Am J Public Health. 96 (4): 624–625. 2006. doi:10.2105/ajph.2005.079152. PMC 1470530. ^ Morris), Suzanne Spellen (aka Montrose (2012-03-20). "Walkabout: Alms for the Poor, Part 2 | Brownstoner". Brownstoner. Retrieved 2017-12-10. ^ "Google Books". books.google.com. Retrieved 2017-12-10. Heath, Sidney (1910). Old English houses of alms: a pictorial record with architectural and historical notes. London: F. Griffiths. Rothman, David J., ed. (1971). The Almshouse Experience. Poverty USA: The Historical Record. Arno Press. ISBN 0-405-03092-4. Caffrey, Helen (2006). Almshouses in the West Riding of Yorkshire 1600-1900. Kings Lynn: Heritage. ISBN 1-905223-21-8. Goose, Nigel; Caffrey, Helen; Langley, Anne, eds. (2016). The British Almshouse: new perspectives on philanthropy ca 1400-1914. Milton Keynes: FACHRS. ISBN 978-0-954-81802-9. 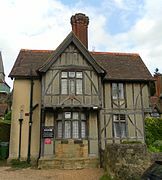 Wikimedia Commons has media related to Almshouses.